A little back story here. In 1970 the IBT was about to achieve a long-standing goal, viz., a national contract that would expire everywhere at the same time. This would immesurably enhance their bargaining power because it would put the spectre of a national truck strike on the table. Clearly, a plus. On the other side, certain locals that had already gotten super-good contracts for their members in the past were asked to accept a less-than-stellar (from their point of view) contract and take the hit for the team. Local 208 in Los Angeles, which organized local delivery and pickup of common freight and had thousands of members, demurred, and was on the verge (some say had already crossed the verge and had voted) of voting down the contract offer but were gaveled out of order by the meeting’s chair. So the vote to strike was either taken and passed, or not taken and not passed and you could find people on both sides of this question. The “No” voters called a wildcat strike which was remarkably effective. 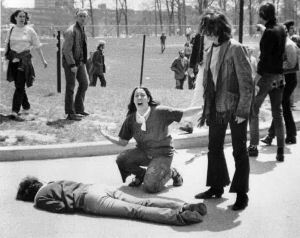 Essentially the same thing, the details of which I do not know, happened in Cleveland in Local 408 (Wow! What synapse fired to make me remember the number of that local! Hope it’s right!). But the companies went to the judge and got an injunction. So Steve the pudgy Teamster came, on his own, and made his pitch to us around the table at the supremely graffiti-defaced Student Union Dining Room. I am embarrassed that I cannot remember the last name of this guy, who was a genuine working class hero who just had a flat-out good idea and carried though with it. Grover E. “Curly” Best and got involved in national Teamster politics. Whatever happened in Cleveland happened and resulted in a call for a national meeting of dissident Teamsters in Toledo, Ohio. We decided to intervene, so Steve and I occupied his ex-girlfriend’s pretty fast car and drove non-stop to Toledo with a hot Gestetner mimeo machine in the back seat, in case there were opportunities for mass agitation. The Toledo meeting founded Teamster United Rand and File. At this point I think Dan’s obit carries the story forward so I will will let it rest with a big wink to Steve, now hopefully at peace. I think it must be your browser. My stuff looks good to me. I am using Chrome. My dad was a Teamster in that wildcat strike of 1970. He worked for System 99. He was one of the men who had to leave California in order to work again. We moved to New Mexico & he worked for Navajo which became ABF. He was able to retire at age 59 with a wonderful union pension. He’s now 81. I”m married to a Teamster who worked for Yellow, but is now the President of Teamster Local 492 in New Mexico. Sorry it has taken so long to get back to you. I am very interested in your comment. If possible, I would like to chat with your dad (electronically) about those days. There is much in my memory that is infirm and a chance to talk to a participant would be very welcome. Thank you for posting! So excited to come across this blog! The wildcat strike of 1970 and its genuine historical value seems to be buried and forgotten. I am the daughter of one of the first 10 men to walk out of Yellow Freight in Pico Rivera in the 1970 Wildcat strike. I remember our home in the days of the strike, full of weary and hungry strikers taking refuge if even for a quick meal and a short nap on the floor. The strikers came in and out all hours of the day and night. My brothers and I would assemble picket signs while our mothers would gather together and feed the men. Of course there were the tears and genuine fear when the men would go back out. Someome was always needing to be bailed out of jail, patched up or help with food for their family. Currently, I am working with my Dad to record and archive memories and momentos of this hard fought battle. My father went on to finish this fight and many more in his union career. He retired but still bleeds Union and the days you speak of are some of his best and proudest moments. I spent a lot of time at the Yellow Freight terminal in Pico Rivera in the years after the strike because (and others of my stripe) got commercial drivers licenses because we wanted to be Teamsters and make the revolution starting in local 208, which as far as we could tell was full of firebrands. I never got hired on there (or anywhere else in Local 208 but I spent a couple of years doing casual work from the hiring hall. I have a hilarious but slightly off-putting story to tell you, if we become acquainted, about my first day working as a casual at Yellow that I am sure will amuse your father. I hope we can become internet-acquainted. I agree with your assessment of the 1970 strike’s significance and think it would be wonderful for info about it to be gathered together somehow. Steve Kindred, who dies just last year, was tghe editor of alittle strike-support paper that me friends and I put out called “The Picket Line”. I have not attempted seriously to track it down but I would imagine that Steve’s estate probably has a full set because it was his baby. Ken Paff from Teamsters for a Democratic Union would be a good contact point for that. I probably know more people connected with that strike as outside supporters than anyone else alive now. The Picket Line as the only friendly newspaper in the world that covered the trial of the Teamsters who went up into the San Bernardino mountains to take potshots at scab trucks. We made a lot of friends. Thanks for the comment. I would love to hear from your father. To date, at least three sons and daughters of participants in this strike have commented on my piece and I would love to get to know them a little over the internet if possible. I would love to hear more about your involvement in the 1970 wildcat. Anything you write will have a permanent home on this blog. There are a number of people, including strikers and especially their children, who follow this thread. Thanks! Fascinating but a bit hard to parse. What is the greek?